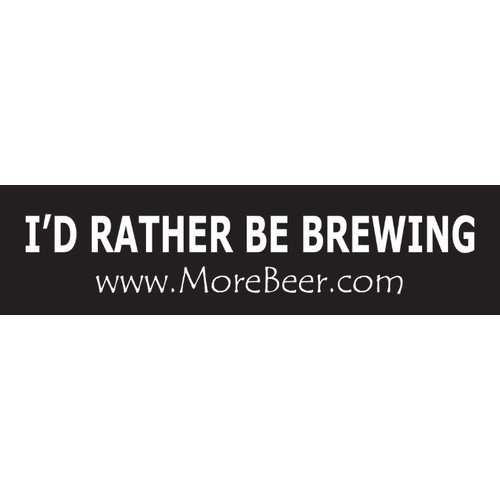 Bumper Sticker - Id Rather Be Brewing! Tell them what you would rather be doing! Of course you can put it on your car but this also seems perfect for your office door, cubicle wall, or actually... anywhere you are not homebrewing! Well on second thought, we do suggest against putting one on your headboard. I guess I am a sucker for stickers. It has been on my kegger door for close to a year now and it is still sticking and looking good. There should be a couple of these in every shipment, FREE! Maybe it is just my cheap nature or because I dont put stickers on everything I see but, why pay to advertise for someone else? Dont get me wrong, more beer is my only online retailer - unless they just dont stock an item - but charge for a sticker advertising themselves? No way. Clever product.... And it sticks! Not much else to say! This product does exactly what it is supposed to. I picked up a few at the showroom. Minimal packaging, so very little carbon footprint. My only complaint was that it did not come with any instructions at all. So if your the type that needs step by step instructions then you may not want this product. It is very sticky, the only thing it would not stick to was my spouses angry face.